Filling out your taxes can be a real headache. It’s no surprise, then, that online software like TurboTax has been growing in recent years to meet the demands of taxpayers in need of expert advice. But there are more resources available to you beyond tax software. Many states have programs to help taxpayers fill out their forms, and some states have an abundance of high-skilled accountants ready to work for those willing to pay. And, given the potentially severe consequences of a tax-filing mistake, the cost may well be worth it. Of course, not all states are equally equipped to help you stay in good standing with the IRS. Below, we look at the best states to get help completing your taxes. In order to rank the best states to get help filing taxes, we looked at six factors. We compared the states by the number of accountants per 1,000 returns, the percent of all workers who are accountants, the relative cost of accountants, the percent of returns completed with professional help, the percent of returns completed with volunteer help and the percent of returns whose filers had internet access. Check out our data and methodology below to see where we got our data and how we put it together to create our final rankings. Northeast has strong support networks From affordable accountants to wide access to the internet, the Northeast has a strong contingent of states where it’s easiest to get help filing taxes. Five New England states, for example, rank in the top 20. South lags behind It may be difficult to get help filing taxes in the South. According to our data, seven of the bottom-ten states where it is most difficult to get tax-filing help are in the South. The Bay State takes the top spot thanks to high scores across the board. In five of the six metrics we tracked, Massachusetts ranked in the top 20. The high average wages in Massachusetts allow local residents to afford accountants if they feel they need one. The average accountant earns just 29% more than the average worker, the fourth-lowest difference in our study. It’s tough to beat Delaware when it comes to accountants. This state ranks third for the number of accountants per tax return and the percent of workers who are accountants. That means Delaware has some of the highest rates of tax experts per capita in the country. Perhaps due to the high proportion of accountants in the state’s population, many volunteers are also on-hand to help locals fill out their taxes. 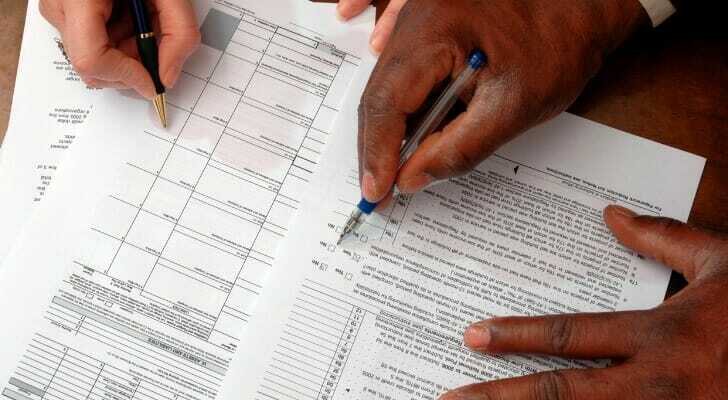 Delaware ranked fourth for percent of tax returns prepared with volunteer help. That state of Colorado has even more accountants than Delaware when controlling for size. Colorado ranks second for accountants per tax return and second for accountants as a percent of the workforce. That should make professional tax help widely available to anyone in the Centennial State. Most households also have internet, meaning if residents can’t afford one-on-one help from a tax professional, they should have easy access to online informational resources. Washington, D.C. has more accountants per capita than any of the nation’s 50 states. Accountants make up more than 1.5% of the workforce, and per 1,000 tax returns, there are about 31.6 accountants who helped prepare them. In both metrics, D.C. ranks first by a fairly wide margin. Compared to the average working person’s salary, accountants are also affordable. The average accountant earns only 13% more than the average worker. D.C. falls to fourth, though, because it ranks below average in percent of residents paying to have their taxes done and percent of residents with internet access. Minnesota has high rates of people either paying for professional help or getting help from volunteers when filling out their tax returns. In those two metrics, Minnesota ranks in the top 20. More than 86% of residents here have internet access at home as well, so whether volunteer help, professional help or help from the internet, Minnesota residents have a wide range of options for guidance when filing their taxes. Overall, Minnesota ranks in the top half for all metrics in this study. Washington residents have the most widespread access to the internet in the country. According to Census Bureau estimates, more than 89% of households have internet access. Come tax time, Washington residents should have no problem finding the best online resources for filling out their tax forms. If online resources are not cutting it, accountants here are relatively affordable: They make only 32% more on average than the average worker. Maryland is home to a large number of accountants, who, perhaps due to their ubiquity, do not earn too much more than the average worker. That means your average resident should have access to affordable professional help if he or she needs it. Maryland ranks in the top 10 for both relative cost of accountants and accountants as a percent of the workforce. Maryland also ranks in the top 10 for internet access and accountants per 1,000 tax returns. Connecticut has affordable accountants and a willing pool of volunteers helping residents fill out their tax forms. Specifically, the average accountant out-earns the average worker by 38%, and nearly 3% of all tax returns here report the help of a volunteer. In both metrics, Connecticut ranks in the top 10. In fact, Connecticut scores no worse than 23rd in any metric in this study. Rhode Island, yet another New England state on this list, has one of the highest rates of taxes prepared with professional help. More than 57% of tax returns here are filed with paid help, while just under 3.1% are filed with volunteer help. In both metrics, Rhode Island ranks in the top 6. Kansas makes it to the top 10 because of across-the-board high scores. This state scores no worse than 27th in any metric. But Kansas also lacks the top 10 scores required to crack the top five. This state’s best ranking in any one metric was 11th for accountants per 1,000 returns. Accountants per 1,000 returns. Data on the number of accountants comes from the Bureau of Labor Statistics and is from 2017. Data on number of returns comes from the IRS and is from 2016. Accountant concentration. This is the percent of all workers who are accountants. Data comes from the Bureau of Labor Statistics and is from 2017. Cost of an accountant. This is the average accountant’s hourly wage compared to the average worker’s hourly wage. Data comes from the Bureau of Labor Statistics and is from 2017. Percent who pay to have taxes done. This is the percent of all returns which have a paid preparer’s signature on them. Data comes from the IRS and is from 2016. Percent who get volunteer help filling out their taxes. This is the percent of all returns that IRS-certified volunteers helped fill out. Data comes from the IRS and is from 2016. Internet access. This is the percent of households with internet access. Data comes from the Census Bureau’s 2017 1-Year American Community Survey. We ranked each state in each metric. Then we found each state’s average ranking, giving a half weight to the percent who had paid help filling out their taxes and the percent who had volunteer help filling out their taxes. Using this average ranking, we created our final score for each state. The state with the best average ranking received a score of 100. The state with the worst average ranking received a 0. Save your refund Getting a tax refund can be a rush. Despite the exhilaration of getting a large check in the mail from the government, though, keep your head on straight. Instead of splurging, the financially prudent move is to invest or save your tax refund. You can probably put a good dent in your savings goals just by tucking your tax refund in your savings account. Talk to an expert If you live a financially complicated life, it’s probably a good idea to have an expert handle your taxes. Business owners or people with high investment income are good candidates for a personal financial advisor. With a personal financial advisor, you can make sure you are saving as much as you can while not paying any unnecessary taxes. To find the right financial advisor, check out SmartAsset’s financial advisor matching tool. 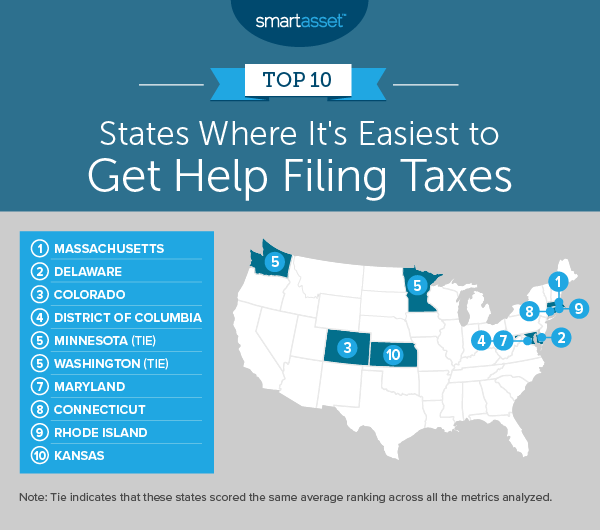 The post States Where It’s Easiest to Get Help Filing Taxes 2019 Edition appeared first on SmartAsset Blog.